UMAi Bresaola | Smoking Meat Forums - The Best Barbecue Discussion Forum On Earth! Discussion in 'Curing' started by SFLsmkr1, Jan 3, 2019. Ft Pierce Florida. Treasure Coast. Have a busy week coming and have to work in a UMAi Bresaola. That is something I would like to try next! Squeeze it in.... seriously !!! Man your busy what you going to do open a store selling all the things your making? Getting the Eye trimmed and patted down for the Bresaola cure time. I do a 2 application dry cure/mix. Below is how i prep the round and how much of the dry you will need for the 2nd application. 5 days in the fridge for the 1st application. Remove from zip bag, apply generous amout for the 2nd application and back in the zip and fridge. Notice the salt is pulling the moisture from the eye. if you have liquid in the bag you can discard. 2nd application and cure will be another 5-7 days. Keep your twine clean and dry. Pat the dry into the meat, Rubbing balls the dry in blotches. here you can tie the eye. Put in large zip lock for the cure times stated above. You will need this much of the dry left for the second application, dont be shy use it up. Watchin this . Love that twine dispenser . Are the spices your own mix or a package mix? Are the spices your own ix or a package mix? what is the difference between cure #1 and cure #2? CURES - Cures are used in sausage products for color and flavor development as well as retarding the development of bacteria in the low temperature environment of smoked meats. Salt and sugar both cure meat by osmosis. In addition to drawing the water from the food, they dehydrate and kill the bacteria that make food spoil. In general, though, use of the word "cure" refers to processing the meat with either sodium nitrite or sodium nitrate. The primary and most important reason to use cures is to prevent BOTULISM POISONING (Food poisoning). It is very important that any kind of meat or sausage that will be cooked and smoked at low temperature be cured. To trigger botulism poisoning, the requirements are quite simple - lack of oxygen, the presence of moisture, and temperatures in range of 40-140° F. When smoking meats, the heat and smoke eliminates the oxygen. The meats have moisture and are traditionally smoked and cooked in the low ranges of 90 to 185° F. As you can see, these are ideal conditions for food poisoning if you don't use cures. There are two types of commercially used cures. Also called Insta-Cure and Modern Cure. Cures are used to prevent meats from spoiling when being cooked or smoked at low temperatures (under 200 degrees F). This cure is 1 part sodium nitrite (6.25%) and 16 parts salt (93.75%) and are combined and crystallized to assure even distribution. As the meat temperate rises during processing, the sodium nitrite changes to nitric oxide and starts to ‘gas out’ at about 130 degrees F. After the smoking /cooking process is complete only about 10-20% of the original nitrite remains. As the product is stored and later reheated for consumption, the decline of nitrite continues. 4 ounces of Prague powder #1 is required to cure 100 lbs of meat. A more typical measurement for home use is 1 level tsp per 5 lbs of meat. Mix with cold water, then mix into meat like you would mix seasonings into meat. Used to dry-cure products. Prague powder #2 is a mixture of 1 part sodium nitrite, .64 parts sodium nitrate and 16 parts salt. (1 oz. of sodium nitrite with .64 oz. of sodium nitrate to each lb. of salt.) It is primarily used in dry-curing Use with products that do not require cooking, smoking, or refrigeration. This cure, which is sodium nitrate, acts like a time release, slowly breaking down into sodium nitrite, then into nitric oxide. This allows you to dry cure products that take much longer to cure. A cure with sodium nitrite would dissipate too quickly. Use 1 oz. of cure for 25 lbs. of meat or 1 level teaspoon of cure for 5 lbs. of meat when mixing with meat. When using a cure in a brine solution, follow a recipe. I have recently tried out a couple of methods of making Bresaola with these bags and it worked very well. Are you planning on trying to air dry it in the fridge (which did not work well for me) or at cool room temperature? Going in the fridge as i have done before. 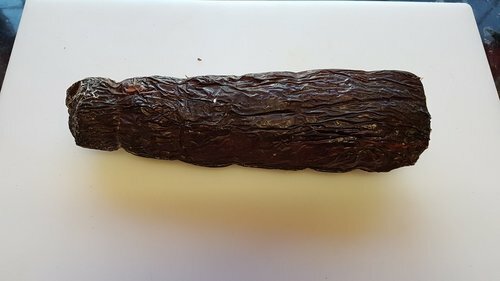 Last year I performed a trial where I left several Bresaola to cure in the fridge in the Umai bags and several to air dry in the bags at ~18 C (64 F), also in the Umai bags. I weighed each of the meats every 7 days to determine when it has lost its required 30% in weight. The air dry bags lost the required weight after ~3 weeks (21 days) whereas the ones in the fridge had only lost 14% after 70 days (10 weeks). Extrapolating this the Bresaola in the fridge would have taken 153 days (22 weeks or 5 months) to reach the 30% weight loss. After the 70 days I gave up in the fridge and continued to air drying them at 18 C. Also after the 10 weeks in the fridge (at 3 C, 37 F) the surface of the Umai bag had begun to grow significant amounts of mould. In contrast the Bresaola cured in Umai bags outside of the fridge showed almost no mould growth. From my experiences I still use the Umai bags, as they act as a partial moisture barrier (to slow down the drying process at room temperature) and they also inhibit the growth of mould on the meat surface. I now package and sell Bresaola produced this way. Second application of cure/spice mix to the Bresaola. Wrap and back in fridge for 4 days before the UMAi Charcuterie bag.